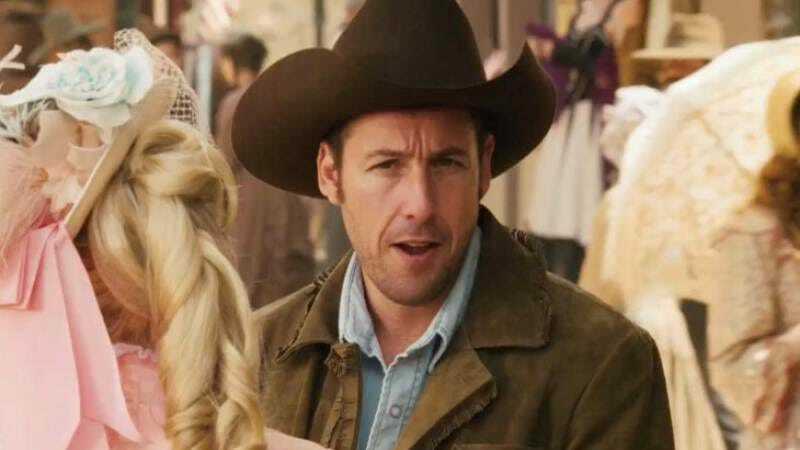 Like a John Ford film someone doodled dicks all over, Adam Sandler’s Western spoof The Ridiculous 6 has already proved offensive on levels both cultural and comedic, leading to around a dozen Native American actors walking off its set over jokes like calling characters “Beaver’s Breath.” It’s all part of the keenly observed satire that is so crucial to Sandler’s comedy, both Netflix and Vanilla Ice have said, and that reportedly extends to using bronzer to darken the skins of actors, including black and Asian talent, to make them look “more Native American”—all applied with the same sort of brushstrokes that went into the script, with the same sloppy, baffling results. “I’m full-blooded Navajo and they bronzed me. I was quite confused,” actress Allie Young recently told MSNBC of just one of the reasons she left the production. As previously reported, that production had made a big deal of hiring a “cultural consultant,” whose entire job was to ensure that the film’s depiction of Native Americans was authentic, inoffensive, and, ostensibly, didn’t involve random ethnicities wearing bronzer. Not surprisingly, Young confirmed that the cultural consultant was the first to quit. Now that consultant, Bruce Klinekole, has given what he says will be his only interview on the matter to Indian Country Today Media Network, which broke the story in the first place. Klinekole confirms a lot of the details we knew already: Completely wrong costumes, seemingly sourced from a Party City (or as Klinekole puts it, “the curio shops called The Running Indian”). Teepees sagging under flowers and fake eagle feathers, which prompted Klinekole to utter the words “total disgrace” for at least the third time in the article. And a total rebuffing from the crew when he tried to get an audience with Sandler or one of the other producers, who told him he wasn’t allowed. After all these offenses, it seems eventually even nature itself rebelled against Sandler’s movie. “What really got me were those eagles,” Klinekole said, explaining how he saw four eagles circling above and, given the deep significance of the number four to Navajo culture, took it as an omen. “It was so strong like the Creator was looking after us Natives and what we were going through. I couldn’t stand it, I couldn’t stand it.” Klinekole soon left, possibly the first person on an Adam Sandler movie set to maintain the belief there is a God and he loves us. Of course, it’s possible those eagles were actually circling buzzards, as Klinekole reveals that the movie’s carelessness also extends to personal safety. In what seems to be the production’s one commitment to authenticity, Klinekole says some of the extras were given genuine, 60-pound hunting bows and real “arrows with razor-sharp steel tips” in lieu of the usual rubber ones, which they were then instructed to aim at Danny Trejo and his “vaquero” gang, even as some of the actors visibly struggled to hold onto them. Still, what’s the risk of accidental manslaughter—or alienating an entire nation of people—compared to the joy this straight-to-Netflix Adam Sandler comedy will someday bring to… someone?